Raft 12 Miles through two rugged canyons of the Colorado River with a stop halfway for a riverside deli meal from the Middle Park Meat Company! 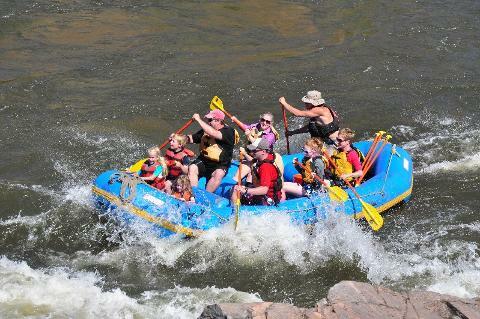 Highly regarded as one of the best Class II/III river trips in America, the fun and splashy rapids of the Colorado River make it the perfect stretch for families, kids, seniors, beginners, large groups, weddings, corporate retreats, and educational trips. Run the exciting rapids of our half-day trip through Little Gore Canyon like "Wake Up", "Needle's Eye", "Mary's Wall", and "Surf City". 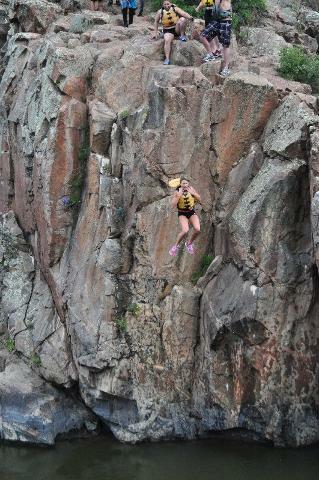 Stop at the Radium Hot Springs and soak in a volcanically-heated mineral pool directly next to the river, or watch the adventure-seekers in your group jump off a 25ft tall vertical cliff into the river at the world-famous "Jump Rock". Float-on past the half-day takeout and get ready for an afternoon of awesomeness in the stunning, desolate, and thrilling Yarmony Canyon (A.K.A. The Red Gorge). 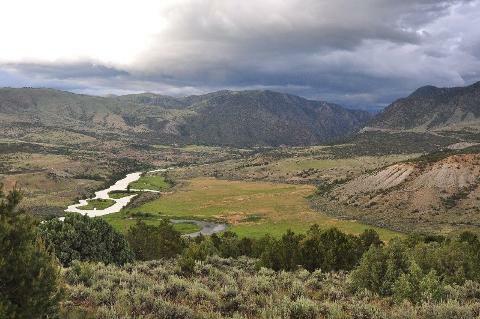 Named after Chief Yarmony of the Ute tribe of Native Americans, Yarmony Canyon's bright-red 1,500ft canyon walls are packed with many species of wildlife including Golden Eagle, Bald Eagle, Beaver, River Otter, Big Horn Sheep, Mule Deer, water fowl, many types of Trout, and if your group is really lucky you might even spot a Black Bear fishing for it's dinner. Raft towards the towering red canyon as you approach Red Eye Rapid, which signals the entrance of Yarmony Canyon. Yarmony Falls, the biggest rapid of the day, lies just downstream. Yarmony Falls is a very splashy, unique, and exciting Class-III rapid that's just a bit rowdier than anything on the half day stretch, but your crew is primed and ready! The locals will tell you, "Run 'er left at low-water, don't hit the hole in medium flows, and don't forget to run-right above 7000CFS! Stop at one of the Colorado River's raft-access only campsites with such clever names as "Island", "Lone Pine", or "Bench 1, 2, &3" for a riverside deli lunch from the award-winning Middle Park Meat Company in Kremmling, CO. Our exclusive riverside meal includes MPMC's in-house deluxe roast beef, smoked turkey, smoked ham, two types of cheese, 2-3 types of bread, potato or macaroni salad, fresh veggies, fresh fruit, chips and salsa, cookies, and more! Your expert river guides do all the work so that you can relax and enjoy your lunch while you admire nature at its finest alongside the Colorado River. 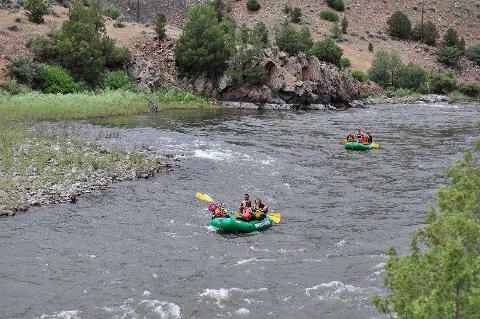 After lunch, get back on the river and maneuver through a few more rapids, punctuated by the calm, peaceful quiet of the mellow river below the canyon. Save enough time and energy to enjoy a side-hike to see the Dinosaur Tracks or take a cool swim before reaching our takeout at Rancho Del Rio. Add an Inflatable Kayak (A.K.A. "Ducky") for the more adventurous members of your group! Great for all ages, beginners, youth, elderly, special populations, large groups, wedding parties, bachelorette and bachelor parties, corporate retreats, team building, schools and educational programs, boy scouts & girl scouts, and more! We can provide for those with special dietary restrictions including gluten free, vegan, vegetarian, or specific allergies if we are notified in advance. Please call us for alternative meal options.